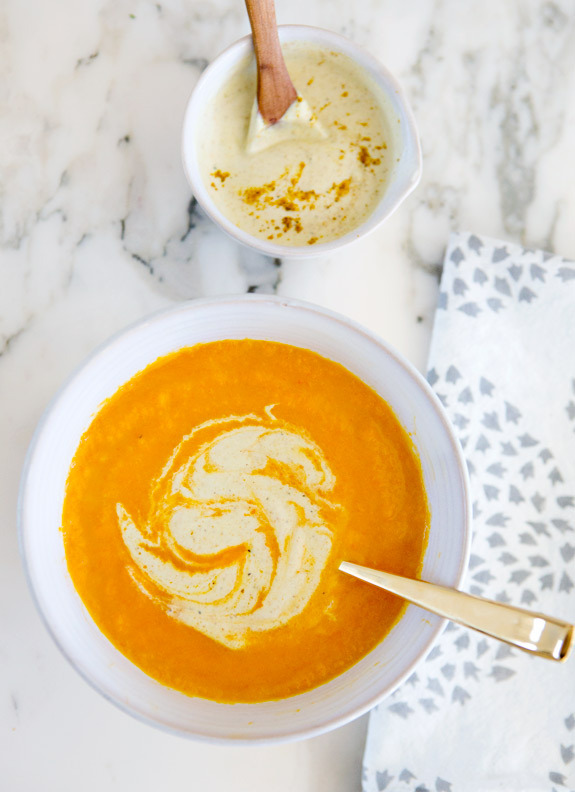 carrot ginger soup – two ways! the weather here was amazing this weekend, i actually enjoyed a couple hours of sunning pool side! and please don’t hate me if you’ve just come in from digging your car out of a snowbank- i did close to 18 winters in maine, i can feel your pain. and your frozen toes. ahhhhhhh! don’t worry, this soup will warm you up. – in a large soup pot combine onions, ginger and coconut oil. cook over medium/low heat until onions are soft and transparent. – add carrots, orange juice, vegetable broth and sea salt to pot and cover. cook over medium/low heat until carrots are soft (somewhere around 20 minutes). 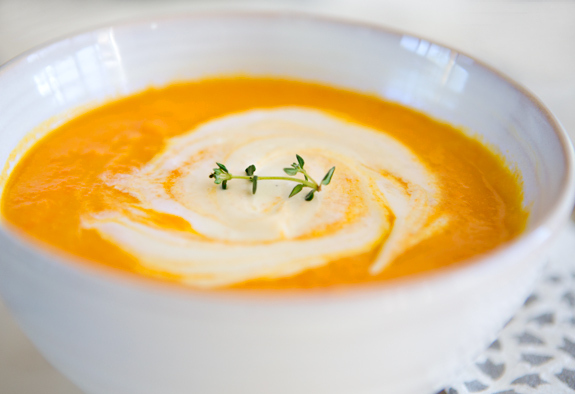 – serve soup with a dollop of cashew cream and a sprig of thyme. OR, mix a little curry powder into the cream sauce (to your taste preference) for a different experience all together! 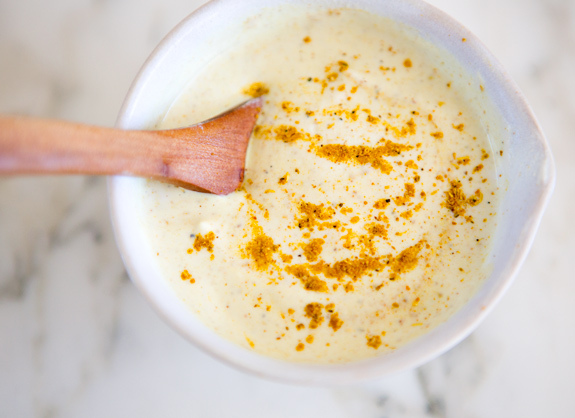 be sure to have a bowl of the cashew cream handy while you’re eating, adding dollops as you go is half the fun! i am so intrigued by the cashew cream! I feel the exact same way about cashew cream- total food from the gods! 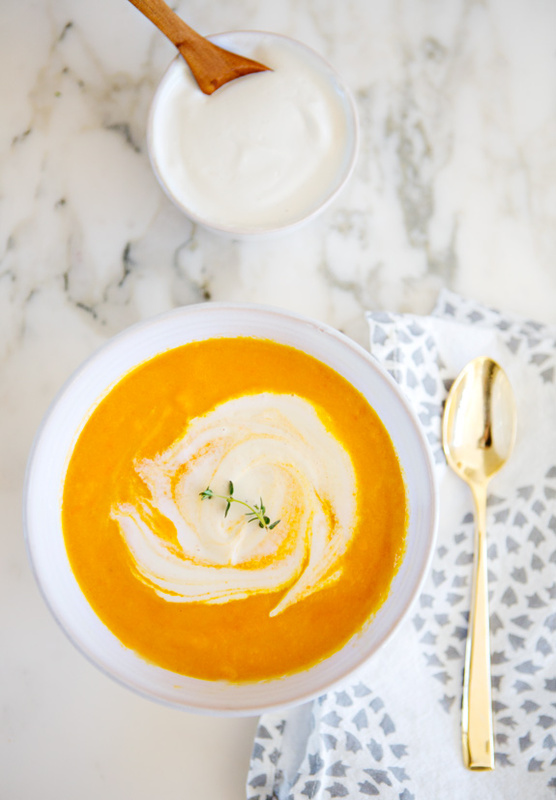 I've been looking for new soup recipes and this is now a definite must try!! Looks wonderful! I have never cooked w/cashews, yes REALLY. But I am gonna be brave and go get some raw nuts at the health food store today and make this gorgeous soup. Thank you! I will get back with you. ok, i've just read through and pinned so many of your delicious gluten free and dairy free recipes. can not wait to try them out!! lovely lovely photos too! Made this soup this week and just wanted to stop back to say thank you! It's fantastic and will be a feature of my winter menus! Haven't tried the cashew cream yet, was using kefir, but look forward to trying that too. I have made this soup 2 or 3 times. Last time I had leftover cashew cream sauce and used it to dip apple slices in it! SOOOOOOOOO good! Better than peanut butter. What an intriging recipe. Can’t wait to make the cashew cream sauce. I just made this soup and it was outstanding! Thank you for sharing the recipe! also cheerful to share my experience here with mates. I just made this with a few substitutions, but only because I didn’t have everything, I will definitely try making this again when I have all the ingredients. I substituted white wine for orange juice, and since I already had a spicy cashew cream leftover from Super Bowl Sunday I used that. It’s one of the best soups I’ve ever had, no joke! Serving roasted brussels sprouts with the soup tonight for my ‘accidental vegan’ meal (I’m not vegan and my husband certainly isn’t but I sneak in vegan meals at least once a week). So fresh and bright and the cashew cream makes it rich and creamy – totally satisfying! Thanks for the lovely recipe, I will be making this again and again. this looks delicious – can’t wait to try it! How many servings does the above quantity make?